The Cups story is an exercise in writing about emotions — writing practice, as are many of my popcorn stories. The practice is to prepare for writing larger fiction works. "They're all the same. You just measured wrong!" It happens once in a while when I make a cup of coffee for him. I measure exactly 10½ ounces into a measuring cup. Then pour hot water slowly over the grounds in the special filter — exactly the way he wants. But sometimes the cup ends up not quite full. "Don't cry! Just pay attention from now on." George grabs the coffee and retreats to the office — without saying how good the coffee smells. In the year since his parents bought this house for us, he has always commented about how good the coffee smells. But not this morning. Maybe because the business isn't going well. My dad tried to convince me not to move in with George. "Why do you want to stay home and cook and such? I know someone has to do it. But it's not a man's job. Do you understand, son? Maybe we can ask your mom to clean house once a week. And do your laundry. And his, too. She wouldn't mind." Seeing that I was sticking to my intentions, he had said, "Son, think about it a while first. You're just graduating high school. There's plenty of time." Thirty minutes after George grabbed the coffee, I deliver his glass of fizzing, nose tickling orange pop and return with his empty coffee cup. Regardless what George said, I wasn't mismeasuring. I'll prove it by filling each cup with exactly 10½ ounces of water. 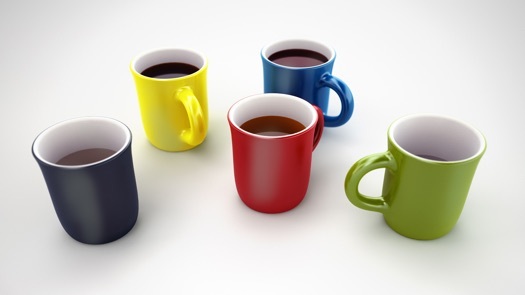 Sure enough, one cup of the set ends up less full that the others. When I inspect them closely, the larger-capacity cup has a different manufacturer's stamp on the bottom. Still, he won't believe me if I just tell him. In the morning, then, I set the measuring cup on the counter with the larger-capacity cup. "Show me!" I demand. "Show me exactly how to measure so your cup fills exactly right. Can't trust myself anymore!" He tries to show me. But, the cup doesn't fill all the way up. After measuring the capacity of the other cups, he looks at me and says, "I'm sorry." "I was wrong, not you." Ten minutes later, he even smells the coffee. Use this form to send a private note to Will Bontrager, the author of Cups.